No charge for City of Dayton Residents (proof will need to be provided). Suggested Donation: 1 can or non-perishable food item for the Dayton Community Food Pantry. Bring your unwanted items to Dayton City Hall for recycling or discard. For more info, see City of Dayton Website. It’s time again for the semi-annual highway cleanup of Highway 221 (Third St.) from Highway 18 to Stringtown Rd. Two miles toward Salem. Fittingly, we’ll hold it on the same day as Dayton’s city cleanup, Saturday, April 28. 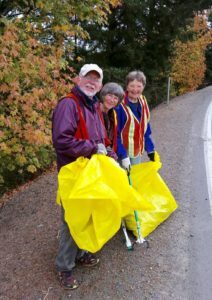 Join your civic-minded friends for a couple of hours making your assigned section of 221 trash-free. Dayton’s Adopt-A-Highway project was started by John Francis and Caye Poe about six years ago and soon became supported by DCDA.